Remember that Etsy shop I mentioned last week? 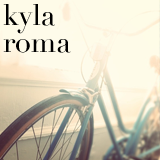 I'm happy to be featuring it today! Meet Eric, the owner of Knob Creek Metal Arts shop, and metal-worker extraordinaire! 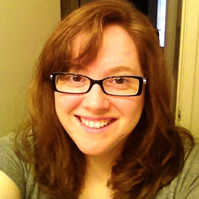 How did you get started with your Etsy shop? I heard about Etsy from a friend from high school. They were talking about how much they loved it, etc. Shortly after I heard Etsy mentioned in an episode of "Weeds" and decided to check it out myself. Etsy is fantastic, nothing else even comes close. How/why did you decide to work with metal? I've been around metal work most of my life. I grew up on a farm where working with metal is a helpful skill. Later I was employed as a designer for industrial equipment company where I gained quite a bit of knowledge in metallurgy. What inspires you? Everyday inspires me. 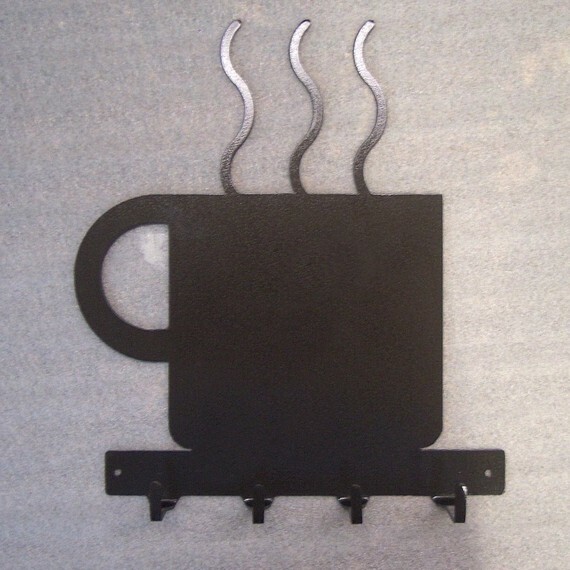 I find ways of designing functional metal art that is not only attractive but also serves a purpose. Most of the items I make actually has a purpose instead of just being art. How do you come up with the items in your shop? Do you set aside time each day (or week) to create or is it more of an "as it happens" basis? Many of my items have come from requests for custom pieces. People email me asking for various items and after I've made it, if it seems worthy, I'll list a similar version on Etsy. Some items catch on quickly and others go to my design graveyard. Is there a story behind the name of your shop? My physical shop is located on the actual Know Creek here in Kentucky, thus the name Knob Creek Metal Arts seemed to make sense. Do you do custom orders? Yes custom order make up about 25% of my business and about half of my designs were inspired from custom requests. What's your favorite item in your shop right now? Does this ever change? 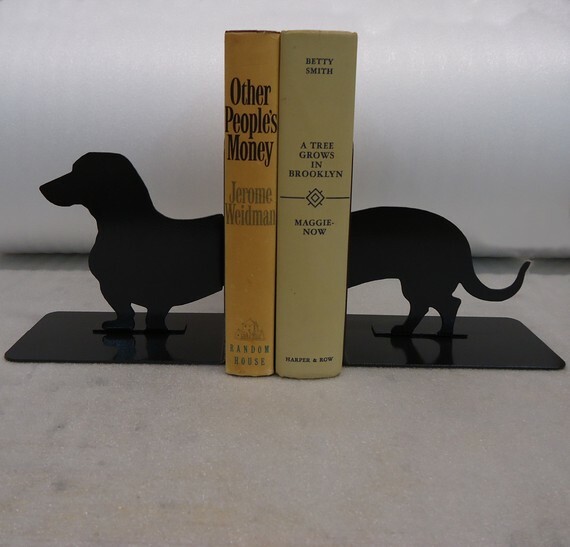 My favorite item right now is the "Weinerdog Bookends" as I recently bought a mini dachshund puppy. Yes, my favorite does change often as I'm constantly added new items. 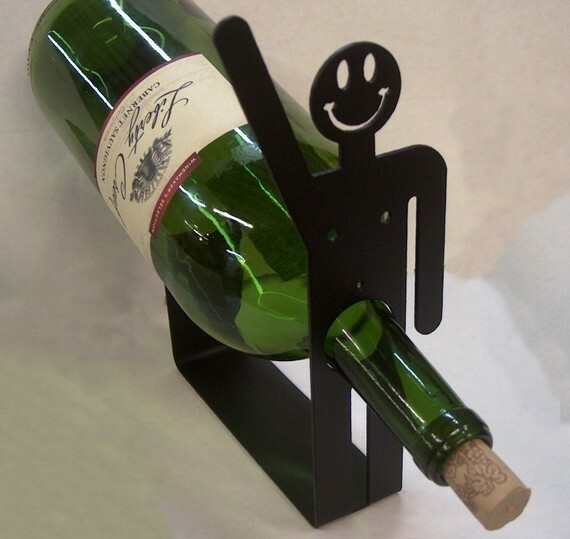 Another one of my favorites is the "Happy Guy" wine holder. It may be a little crude for some people's taste but it's funny (in an immature way) and I still smile every time I make one. It was my first big seller and it was a totally original concept that I came up with. And just for fun: if you could eat one food for the rest of your life what would it be? This is a hard one but I'd go with pizza as long as I can keep changing the toppings. Isn't his work amazing? It blows my mind to think someone takes a chunk of metal and creates something from it. His shop makes me want to have a lot of keys so I can order about five different key racks! (And I think the Happy Guy Wine Holder Rack is hilarious). What do you think readers? Thanks for answering my questions, Eric! Fun! I love the keyholders, the coffee one and of course the golden retriever one. The wall art is beautiful too. Ahhhh! I need those weinerdog book ends for a gift! My family loooooves dachshunds! wow, that wine holder has my entire office cracking up! We can't think of life without metal.. Metal now has become a part of our life.. Every thing that we use in our daily routine is of metal..